In yesterday’s post, we took a look at the new Elven Union team and the accompanying Elven Union dice set. Today, we break open all three new pitches (OK, so one of them isn’t EXACTLY new) that hit stores shelves in the last few days. 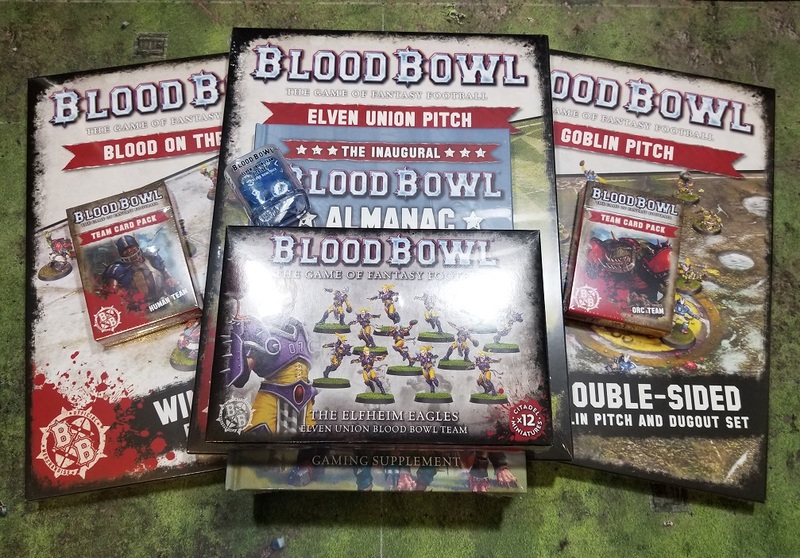 Did I really NEED three more pitches for Blood Bowl? Of course not, but it’s not like I WASN’T going to buy pretty much anything that Games Workshop released for Blood Bowl. Well played Games Workshop… well played. The third pitch is a re-release of the Blood on the Snow Human/Orc Christmas themed pitch that sold out in about two seconds last Holiday Season. By all reports, Games Workshop was completely unprepared for the popularity of the Blood Bowl relaunch last year. It seems they have learned from their mistakes because as of this writing, all three pitches are still in stock on the Games Workshop website. First up is the Elven Union pitch. As previously mentioned, the Elven Union pitch has a “normal” side as well as a frozen side. The two sides of the pitch are worked into the special rules in an interesting way. The premise is that the Elven Union pitch is located in an area with so much magic flying around that it causes sudden and random weather changes. Basically, you randomly pick which side of the board you start with, and then each time you would normally roll on the Weather Table, you roll a D6 and on a 4, 5, or 6, you flip the pitch over to the other side. An interesting idea, but that MIGHT be irritating if you JUST set up both sides for a kick-off. You randomly pick which side of the board you start with and at the end of each drive, you simply roll a D6 and on a 4, 5, or 6 the pitch is flipped over. * Luckily, the Weather Table isn’t usually rolled that often once you have started the game. *It was pointed out that I originally misread the pitch rules. Having read through the pitch flipping rules several more times, I feel like they could have been worded much better. Like the pitches themselves, all three sets of dugouts are also double-sided. With the Elven Union dugouts, the differences between the two sides are fairly minimal. Basically, one side has a couple of rugs and a cabinet, while the other side has a cot to treat the wounded. Most everything else seems almost identical between the two sides. The normal side of the pitch is really nice, and what you might expect for a Elf team. The pitch has a design in the grass that appears to be intended to mimic the patterns that professional sports arenas have when the grass is purposefully cut in different directions. Maybe that isn’t the original intent, but that’s what I think of when I look at it. The effect is well done, and being a pitch for an Elf team, the design has much more flourish than the simple diamond shapes that we Muggles see in baseball fields and the like. The pitch also has lots of small details ranging from scattered gems, to scattered blood stains. The overall effect is really nice and very fitting for the Elf Union team. The frozen side of the pitch reminds me a lot of a hockey arena. It even has what appears to be spot light circles on either side of the Line of Scrimmage. Like the normal side of the pitch, the details on the frozen side are great and the pitch is definitely worthy of the minis that accompany it. While the Elven Union pitch does not come with a custom Weather Table, it still comes with it’s own set of custom rules. When using the frozen side of the pitch, any player that moves more than 6 squares will automatically move an extra square at the end of their movement as the slip across the ice. As you might expect, there are definitely risks to this extra square of movement, so you will need to be judicious with your your ice skating experiments. Next up is the new Goblin pitch. I have to admit that even though Andy Hoare had said that more team themed pitches were coming, I was quite surprised when the pre-order for this pitch was announced. Maybe it was talked about before the announcement, but I don’t remember hearing about it until the pre-order announcement hit the interwebs a few weeks ago. In any case, I was happy to see the initial images with the announcement. Like the pitch, the dugouts have a standard side and a flooded side. Unlike the Elven Union pitch, it’s pretty obvious which sides of the Goblin dugouts are which. The Goblin pitch looks almost like some sort of alien moon. Along with all of the usual type of details that get packed into the pitch designs, the Goblin pitch is completely covered in impact craters. The result is a pitch that looks like it would be a nightmare to play on (in a good way!). Unlike the Elven Union pitch, the Goblin pitch does come with its own custom Weather Table. The rules state that the players start the “dry” side of the pitch up, then any time you roll on the Weather Table, a 9-12 result gives you a “Brisk Downpour” which could lead to a need to flip the pitch over and continue the game on the flooded side of the pitch. One play resumes on that side, there are some additional rules that can make the game much more interesting, and challenging. The flooded side of the board has a lot more going on, visually, than the dry side. Making out the movement squares is a little harder on this side, but it isn’t too bad. I feel like the Orc side of the boxed set pitch is harder to make out. Other than that, the flooded side of the pitch looks great. It feel like someone put a LOT of time and effort into getting it just right, and not going too overboard with the details. With all that water this side of the pitch, you get a slight cushion when your players go down, but you might also find yourself stunned a little longer than you are used to as well… Either way, the rules sound like they might add a few laughs to casual games. I laid both pitches out and spent several minutes comparing details, and I wasn’t able to spot a single difference. If you are also one of the lucky (or maybe just plain obsessed) people who actually managed to lay hands on one of the pitches from the first round, there shouldn’t be a need pick up a second copy. That is, unless you’re like me and just HAD to have the Christmas themed dugouts… Speaking off. 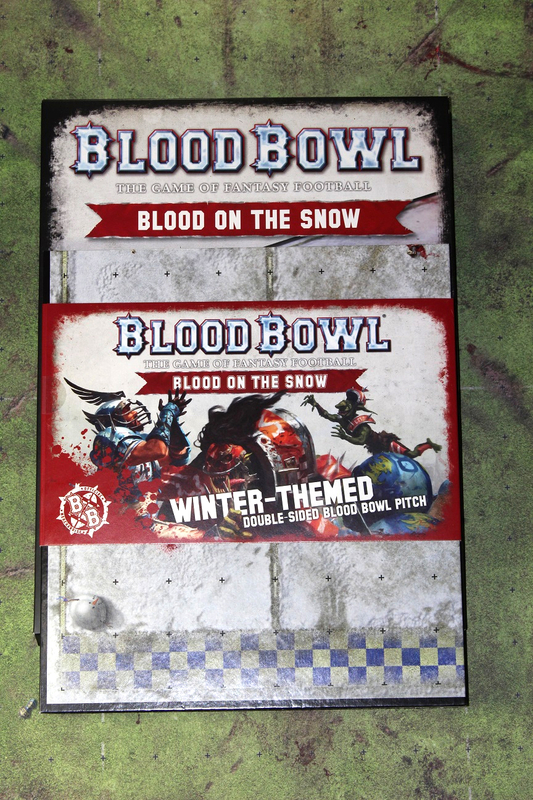 The Blood on the Snow dugouts, like the pitch they are designed to match, represent the Human team’s dugout on one side, and the Orc team’s dugout on the other. The details great and really drive home the Christmas theme. 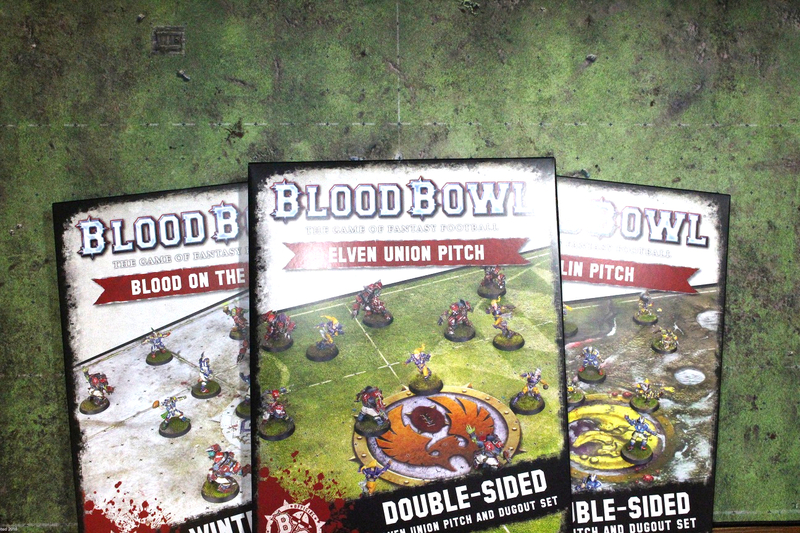 Being Christmas themed, the pitch not only has the typical Blood Bowl standards like Blood Splatters and severed limbs, but it also has things like Snowmen and Christmas trees. It also has the same custom Weather Table that we saw last year. The Orc side of the pitch is similar to the Human side, but a little darker in tone. The snowman on the Human side is your stand fare, while its twin on the Orc side might be more what you would call an “evil twin.” The Christmas tree is also nothing more than dead branches. In short, exactly what you might picture from Orcs. One question you might be asking yourself is if you really NEED to buy any other these pitches. If you already have the boxed set, or if you picked up the any of the previous pitches (neoprene pitches from Forge World or the Skaven and Dwarf pitch), then the simple answer is no. However, if you don’t have a pitch already, or you are simply a freak like me, then there is no reason at all not to at least consider these new pitches. Personally, I really like them. They all have really nice details on both the pitches themselves, and the dugouts. At $38 a piece, they aren’t overly cheap, but considering the boxed set retails for $100, they’re definitely a more affordable option if you aren’t interested in the Human and Orc teams. Let me know what you think of the new pitches in the comments below! This entry was posted in Blood Bowl, Gaming, New Releases and tagged Blood Bowl, Blood on the Snow, Blood on the Snow pitch, Elven Union, Elven Union pitch, Fantasy Football, Games Workshop, gaming, Goblin pitch, Goblins, table-top games, tabletop wargames, wargames, Wargaming by Mike C. Bookmark the permalink. My name is Mike and I am an addict... a Blood Bowl addict! I have been playing Blood Bowl since about 1996 and have WAY too many teams and boxed sets. I also play Mordheim and I like to build terrain and ramble about games a lot. The flip boards with different weather/effects is actually pretty ingenious. I often forget that certain weather effects are in play, but having a board that signifies the change is a great reminder. Since the weather changes before setup, it’s not too tedious to integrate either. I’d be interested in seeing more boards with flipped weather effects and getting rid of the old weather tables. I guess it’s too ingrained in the products and existing rules to do that though. Plus if you rely on the boards, you would be limited to two weather effects, unless they want to force people to buy more boards for each weather change. It’s an interesting concept. I’m curious to see how it actually plays during a game.